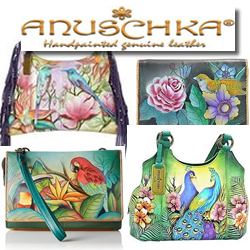 Anuschka™ is a premium brand of hand painted accessories. And yet, each Anuschka creation is so much more than merely an accessory. It is a story. exquisite hand-painted collectibles by our skilled artisans. So that you can own a prized piece of handcrafted storytelling. Short rope handle with drop of 5". Detachable, adjustable crossbody strap with drop of 14"-26". Inside zippered wall pocket and two multipurpose pockets. Shoulder strap with 13” handle drop.